Let’s demystify the art and practice of leadership. There are many parallels to the aspects of riding a bicycle and leading the team. First of all, the purpose or usefulness of the bicycle is to get from point A to point B. Clearly, leadership is focused on forward movement toward a vision of a future desired state. The bicycle has a framework or structure that allows it to transfer energy to serve a positive purpose. Leadership, truly is about energy management and how to focus the individual and collective energy on meaningful goals of the organization. The bicycle below has been labeled to indicate the essential elements of the practice of effective leadership, so let’s see how they create a meaningful, metaphorical framework for understanding leadership. Starting with the bicycle seat, this is from where leadership operates, steering and empowering the organization. The structure that holds leaders in their seat is trust. This essential element represents the “currency” of leadership and gives leaders credibility to lead. The essential (orange) bicycle frame represents the structured communication paths that must exist to connect all parts of the organization. One hand must know what the other is doing. The handlebars symbolizing strategy are what leaders firmly grasp to provide clear direction to the team. This direction must also be clearly and compellingly communicated to the rest of the organization for the organization to get where it wants to go. The back tire represents the people of the organization – where traction occurs if it is to occur. The internal structure of the back wheel represents the various applications for direct coaching conversations to connect people and provide valuable information for change. Coaching can (and should) flow Up, Down, and Sideways – in all directions. The pedals are connected by the chain to the sprocket of the back wheel, and represent the energy transference and action delivery to the system. If the pedals are functioning well (as operated by Leadership), they create accountability which leads directly to empowerment. The mechanism for transfer is the feedback chain. Without that – the organization goes nowhere. If power is effectively transferred through coaching to the people of the organization, then engagement occurs and forward momentum is created. We see the tire on the front wheel of the bicycle represents our focus on customers. Clearly, setting our Course (Vision, Mission, Core Values, Key objectives, and GRRATE Expectations) must anticipate customer’s needs and serve them well. So there you have it – the essential pieces of contemporary leadership clearly connected to the structure and functioning of a bicycle. There is no part of this bicycle that you could do without. If any of the operating parts were damaged or broken, you see the direct negative impact upon the whole organizational system. All of these pieces are mutually-interdependent upon one another for the proper functioning. With a well-oiled machine, and effective leadership with their you-know-what in the saddle, the organization moves forward toward desired strategic objectives. It is obvious that the key role that coaching plays in the practice of leadership. We are fond of saying that “If you can’t coach, you can’t lead.” They are inextricably connected in philosophy and practice. So, let’s use this diagnostically to see what the implications are for organizational functioning and performance. If Leadership is ineffective, nothing much happens. The stronger and more effective the leaders become, the “ride” for the organization is enhanced…more speed, safety, service to customers, etc. Everything gets better. If Strategy is unclear or unexciting, and no one is able or willing to follow it, game over. The organization will flounder and certainly NOT end up getting where it might have. If Communications (in general) are untimely, inaccurate, or muddled, the framework breaks down and chaos ensues. Good structured, high integrity communications keeps everything flowing. If the front wheel representing Course (and all of its elements) is not focused on Customers and integrated and coherent, again, chaos occurs. You might end up in a ditch. Without effective Coaching and feedback between colleagues who work together, people and teams are severely inhibited in their ability to make good decisions, and course-correct as necessary. Problems take longer to solve too. 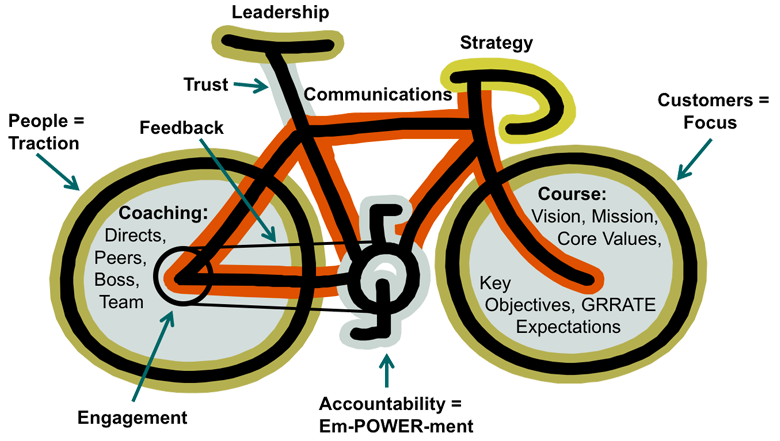 As the chain suggests, without leaders being able to “transfer” energy, accountability, and empowerment to others, through the mechanism of Feedback, the bike goes nowhere. PS – and oh by the way…when we learn to ride a bicycle, we never forget. Effective leadership practice, once learned, gets into your bones. Happy peddling!